LOVE the Yoga for Sciatica video! I’m off on a short term disability claim as two weeks ago a severe case of sciatica came about and for the first three days I couldn’t even care for myself. It’s never been this bad and it’s never taken this long to rejoin the flow of life again. 1). Is downward dog considered a straight legged forward fold? Yes! If your legs are straight! 🙂 You can bend your knees in downward facing dog quite deeply and that should keep it from being a contraindication for sciatica. 2). The last pose of the video has you sitting with your legs straight out in front of you. I find that really painful still. Is there a modification I can do? If I bend my leg up by my hip it relieves the pain but I can’t quite keep both cheeks on the ground and my foot isn’t quite flat on the floor. So the last pose of the class is matsyendrasana – a seated twist. Think about filling the space. You can either sit on a blanket to elevate your hips – which I think might help quite a bit …. or you can fill the space on one side where your hip is elevated. Give that a try and let me know how it goes. 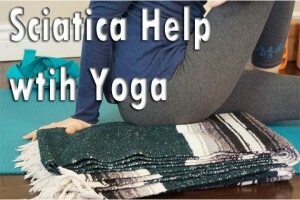 If you are interested in the Yoga for Sciatica video it is available on my membership site or in my shop.